The thorax of a trilobite (yellow in image left) is comprised of a number of separate segments, usually of similar shape and varying somewhat in size, that articulate with each other and with the posterior edge of the cephalon and the anterior edge of the pygidium, allowing the trilobite to bend, primarily upward and downward, and in many species, allowing the animal to enroll as a protective behavior. As with all of the major parts of the dorsal exoskeleton, each segment of the thorax bears a central axial lobe between two symmetrical pleural lobes (right). Underneath the animal, each thoracic segment bears a pair of legs and gills, but there are also limbs under the fused segments of the cephalon and the pygidium. 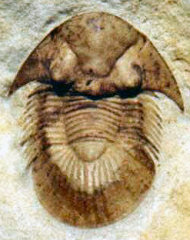 The occipital segment (the posterior-most of the fused segments that make up the cephalon) and the anterior-most segment of the pygidium are morphologically most similar to the thoracic segments in many species of trilobites. This is partly a function of ontogeny, in which the pygidium releases thoracic segments forward during growth, and the functional constraints of the articulation of cephalon and pygidium with the first and last thoracic segments, respectively. 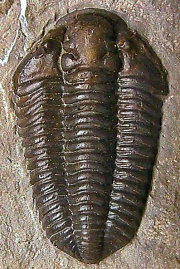 This can be seen in the trilobites shown below, as well as variation in thoracic structure. Huntoniatonia oklahomensis Olenellus gilberti Reedops deckeri Breviscutellum sp. In the images above, sometimes the similarity between the occipital segment and the thoracic segments are striking. In Reedops deckeri, een the round lateral lobes on either side of the thoracic axis are mirrored in not only the occipital lobe, but also the glabellar lobe immediately anterior to it. The occipital segment of Modocia laevinucha is partially defined by the posterior facial suture, which further enhances the similarity between that cephalic segment and the first thoracic segment. In Huntoniatonia oklahomensis, the pygidial segments look very much like fused thoracic segments. Indeed, the spines of the pygidium of Arctinurus boltoni are so similar to the backward-facing thoracic pleural spines that it is difficult to tell where the thorax ends and the pygidium begins (there are 11 thoracic segments and three pairs of pygidial spines). A structural thoracic feature associated with enrollment is the pleural fulcrum, where there is a clear change of angle from the near-horizontal inner pleural region to a more steeply-sloped outer region. 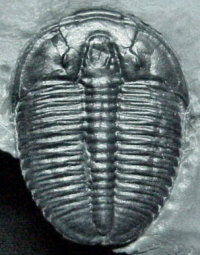 In the trilobites above, the fulcrum is particularly apparent in Calymene, Reedops, and Breviscutellum, and is subtle or lacking in Olenellus, a primitive species that was not thought to enroll well. The images below detail some of the thoracic structures that allow articulation and movement, and show how the separate segments fit neatly with each other, in a species for which articulation details have been well-studied. 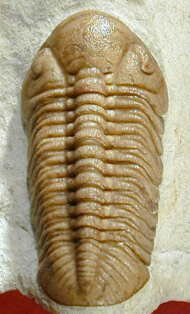 Ceraurinella typa (above) is a cheirurid trilobite with 11 thoracic segments. The details of its thoracic morphology are well known, and will be used here to demonstrate how segments articulate with each other. Two segments have been highlighted here in color, and are enlarged in the figures below. 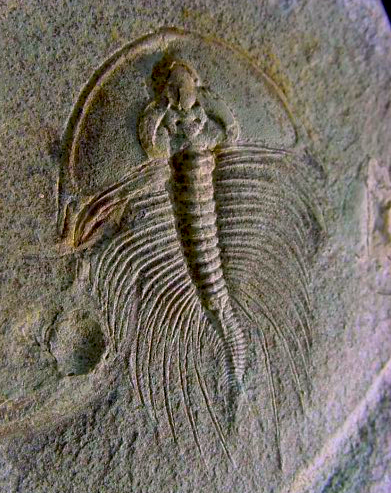 When the trilobite is completely intact, it is not possible to see some of the structures that link the segments. One thoracic segment, separated from the others, shows the portion that is typically visible in light brown, and structures that are usually at least partially hidden by adjacent segments in other colors. Anterior of the axial ring is an articulating half-ring (blue), that fits under the axial ring of the neighboring segment. Similarly, there are anterior processes (knobs) near the axis and near the fulcrum, that lie along an anterior flange (green). These fit into sockets on the posterior flange (yellow) of the adjacent segment. (see below). Seen from the side, the same structures described at left are shown in matching colors. How these fit with adjacent segments is shown below. The image above simply shows how the anterior processes of a segment fit into the posterior part of the segment in front of it. Similarly, the articulating half-ring fits under the posterior edge of the axial ring in front of it. The overlap area of the articulating half-ring is shown as a dotted blue line. The same fit relationships are shown from the side here. 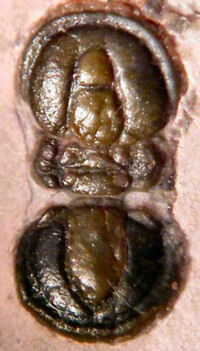 The minimum number of articulated thoracic segments in a typical trilobite with articulations between cephalon, thorax and pygidium is two, in Agnostida such as Peronopsis interstricta (below). 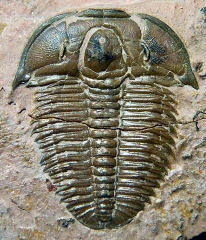 However, one strange trilobite, Schmalenseeia fusilis, has no articulations at all! 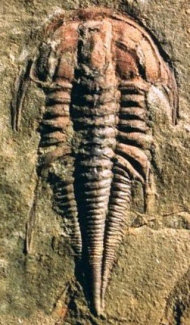 Cephalon, thorax, and pygidium are all fused into an unbending oval dome, and it is only the presence of articulated close relatives that this strange species can be called a trilobite at all! 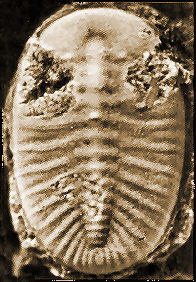 Typical trilobites might have several to many thoracic segments (Elrathia kingi, perhaps the most common trilobite known, has 13 articulated thoracic segments). The maximum number of articulated thoracic segments is seen in the emuellid trilobite Balcoracania dailyi, with an exceptional 100+ articulated thoracic segments! 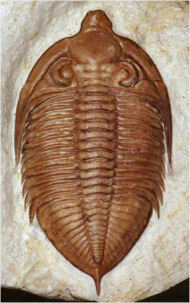 Although the primary bending plane of a trilobite was vertical, some horizontal thoracic bending was also possible. This added flexibility might be useful for foraging through complex environments, such as reefs. 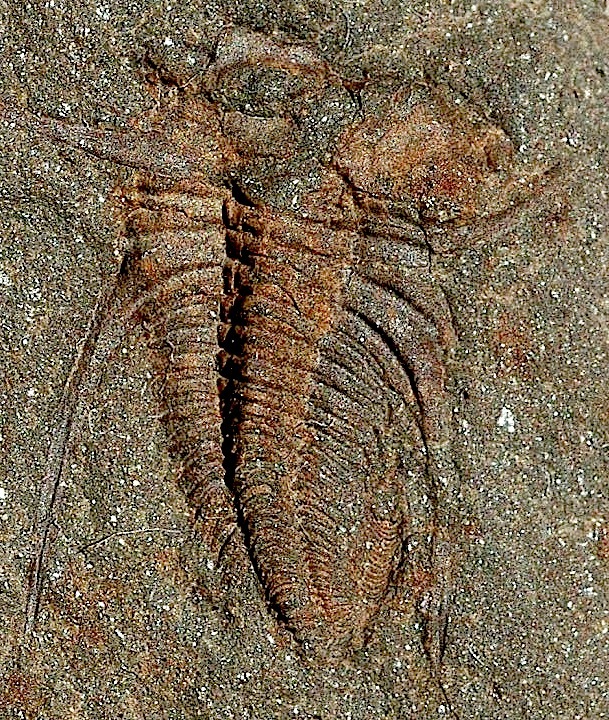 However, the majority of trilobite specimens are more or less straight, with little or no lateral axial flexing, although many are found showing vertical flexing, including full enrollment. Perhaps lateral bending was limited, or in death relaxation of internal muscles straightens the body. A few long-bodied primitive species have been found showing lateral flexing, as in the Balcoracania dailyi (left), Olenellus fowleri (middle), and Olenellus terminatus (right) shown here. 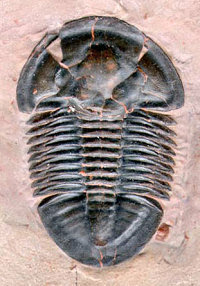 wide pleural fields, relative to the axis, would have greatly limited lateral range of motion in a trilobite such as Elrathia (above). Thanks to George Ast for the Nevadia and Olenellus images. Chatterton, B.D.E. & M. Campbell. 1993. Enrolling in trilobites: A review and some new characters. Memoirs of the Association of Australian Paleontologists 15:103-23. Harrington, H.J. 1959. General description of Trilobita: Thoracic region. In: Moore, R.C., ed. 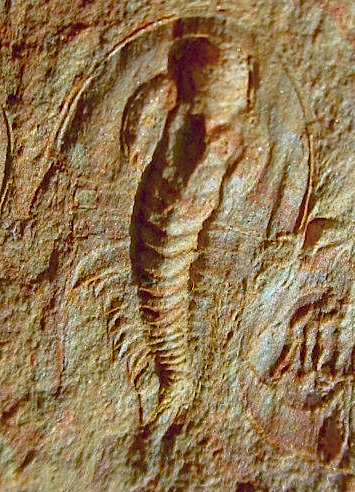 Treatise on Invertebrate Paleontology, Part O, Arthropoda 1. Geological Society of America & University of Kansas Press. Lawrence, Kansas & Boulder, Colorado. xix + 560 pp., 415 figs. Hughes, N.C. 2003. Trilobite tagmosis and body patterning from morphological and developmental perspectives. Integrative and Comparative Biology 43(1):185-206. Hughes, N.C. 2007. 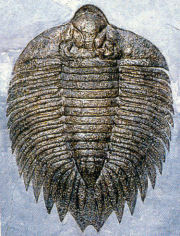 The evolution of trilobite body patterning. Annual Review of Earth and Planetary Sciences. 35:401-34. Whittington, H.B. 1997. Morphology of the exoskeleton. In: Kaesler, R. L., ed. 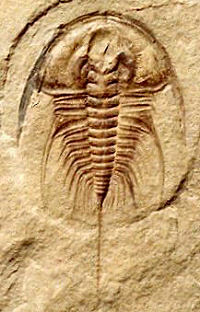 Treatise on Invertebrate Paleontology, Part O, Arthropoda 1, Trilobita, revised. Volume 1: Introduction, Order Agnostida, Order Redlichiida. The Geological Society of America, Inc. & The University of Kansas. Boulder, Colorado & Lawrence, Kansas. xxiv + 530 pp., 309 figs.